Sarah Addison trusts Dr. Shafer, and you should too! Orthodontist Dr. Shafer is a top rated orthodontist in Champaign and Mahomet, IL. He’s been practicing orthodontics for over 25 years. 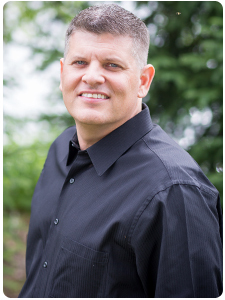 Dr. Shafer received his bachelor’s degree from Eastern Illinois University and then went on to receive his Doctorate in Dental Medicine from Southern Illinois University (’92) where he was second in his class. He received his master’s degree in orthodontics from Marquette University (’94). Dr. Shafer was certified as a Diplomate of the American Board of Orthodontics in February 2005. Dr. Shafer and his wife, Michelle, have three children: Lane, Sydney and Ella. He and Michelle grew up in Catlin, Illinois, and they now reside in Mahomet, IL. Dr. Shafer became interested in orthodontics as a result of his own experience with his orthodontist. This helped him to realize the importance of a beautiful smile and how it affects a person’s self-esteem. Dr. Shafer and his family are active in their church, and Dr. Shafer has been a leader in Bible Study Fellowship for over 20 years! Dr. Shafer and everyone in his office are amazing! Your first appointment is awesome. You feel so welcome. Every time I check in I don’t need to do anything. They see you walk in and check you in, they know who you are! There were no issues when I had to bring my little ones, 3 y.o. and 1 month old. I had brought a friend to keep them entertained but they said my kids could come back with me if I wanted. I have terrible anxiety when it comes to dental work. The friendliness and experience everyone has helps keep me calm. I am always in and out. I don’t remember an appointment that was pushed back due to the office being behind. I love it here so much I wish he also did regular dental work. Dr. Shafer and his staff provide such a warm welcome in their offices. They give a thorough explanation of everything they will be doing and are doing before each appointment and after. To keep parents and patients in the loop they re-iterate at each visit what is going on and how it’s a step closer to the ultimate goal of straight beautiful teeth and a superb smile. Our first child had braces from his office and Dr. Shafer’s work was so satisfying with no complaints that we chose to take our second child there to start the orthodontic adventure with Dr. Shafer and his staff. Thank you Dr. Shafer and staff for your hard work, dedication and determination. Our family appreciates it more than you will ever know! I’m towards the end of my braces treatment and I must say I had the best experience ever! The staff is great and super friendly. I’m usually in and out unless they need to do extra work but other than that I walk in the door, I’m greeted and 90% of the time I walk straight to the back and they get started! Dr. Shafer is awesome! I can tell he genuinely listens to me when I have a concern or he’ll begin by asking me if I have any questions or concerns before even starting. He also has two offices, one in Champaign 5 min away from house which is a bonus and one in Mahomet if you happen to be closer or live in that area. Highly recommend!